Both offers the same things but I wonder if PS4 NAT2 works fine any of them. I know several people with a PS4 and Telenet... none of them has issues... so I guess something else is wrong. Yeah, NAT 1 is straight from the modem to the PS3. NAT 2 is CORRECTLY running from a router to the PS3, and NAT 3 in INcorrectly running from a router to the PS3. The main thing that causes NAT 3 is not having the correct ports opened up on the router. I got bbox 3 router. Even when I set PS4 in DMZ it is still NAT3. You can still play online but then you are not able to host games for other players. edit: i tried also forward all ports. As far as I know there is well know issue with bbox 3 and PS4 (maybe not affecting PS3). Laatst gewijzigd door komaeu op 05 Feb 2015, 12:04, 1 keer totaal gewijzigd. Even in the DMZ you still need to forward the required ports ! I forwarded them just to check all combinations(with/without DMZ), didn't work. Anyway I am suprised when you say that DMZ needs port forwarding. Isn't this game dependant ? Just check this... http://playstationclan.be/index.php?topic=36.0 (BTW disabling homespot is nonsens). Ok man. I will try to do some more research today, maybe I will achieve something. Thanks. r2504 schreef: Even in the DMZ you still need to forward the required ports ! Care to elaborate ? AFAIK putting a client in the DMZ causes all incoming connections to be sent to that client anyway. If you put a PS4 in the DMZ, there should be no port forwarding rules required. A Telenet user with a Bbox3? Not the usual combination. Tomby schreef: Care to elaborate ? AFAIK putting a client in the DMZ causes all incoming connections to be sent to that client anyway. I don't know how TN implemented their DMZ... but I see everyone with for example a second router in the DMZ doing port forwards ? Haven't tested it myself, so I can't confirm the requirement 100%. They should just burn those devices BBox3 is worst router I have ever seen. Even forwarding ports(setup via www) fails and crash from time to time. Whole web interface lags a lot and freezes. Applying setting in 60% fails. This device is nightmare( I had alrady 2 different bbox3). You should check the manufacturer of the Bbox3 you have. There are 2 suppliers (Sagem and Technicolor), so you should check on the bbox3 who fabricated the modem. If it's a Technicolor, try to catch a Sagem Bbox3 sinds the Technicolor model is known for NAT issues with the PS4. [EDIT] I understand your post(s) better now. If returning to Proximus or any other xDSL provider for that matter, check the manufacturer like I wrote before. Or better: ask a Sagem device and explain that you do have a PS4. On the other hand it seems strange that you do experience NAT issues. Never had them on the PS4 when I still was a Telenet customer... All worked out of the box. komaeu schreef: They should just burn those devices BBox3 is worst router I have ever seen. If you believe other routers do better, then just use the B-box3 (any brand) or B-box2 as a modem only, and start the PPPoE session on your own router. Then you'll have all the freedom to customise your own settings. I'm a ps4 gamer , playing mostly destiny. 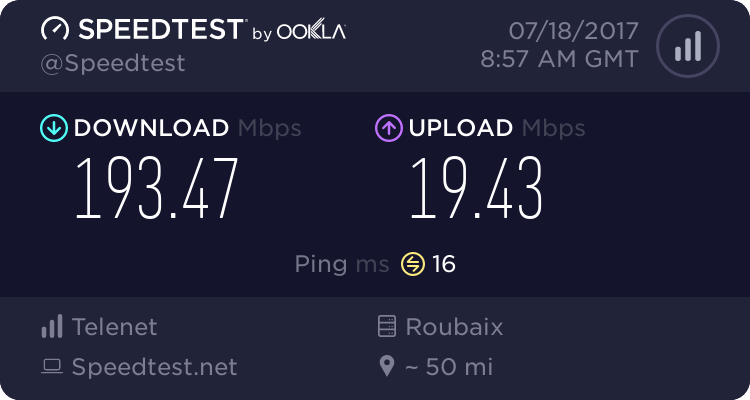 i got a new router from proximus. B-box3... when i game online i get booted a lot due to poor connection. anybody can help me?